May 27, 2008. The rain is pouring outside. I’m sitting in front of the computer wearing pajamas and wishing for a cup of Great Taste cappuccino. Already had a cup of coffee this morning so I guess I’ll have to make do without one for this afternoon. Melancholy mode. Summer’s gone. I’m drifting in that space between the first semester and the end of summer. But all I know is this – summer’s gone. But the memories will remain. Memories. I’ll treasure this summer forever. I’ve always treasured the past summers and I’ll add this one to that treasure box where I keep the sights, sounds, and scents of the summers that passed by. Because those summers did not just pass by. They are a part of me forever. Past summers. All my summers were memorable. My first one at elbi challenged me to seize the moment of everyday. It was that summer that I first spoke at a DOST-SOEP, the first that I spent a night staring at a clear, starry Batangas sky, the first that I lived inside a house with a rat going by the name of Alfalfa Weevil. That summer, I also went through dealings with my discipler and learned a lot of lessons in the process. My second summer, meanwhile taught me a lot about personal intercession, about being a guard on constant duty. 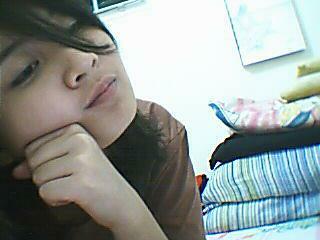 That season was marked by days packing at Carbern, days living on pancit canton, and days just thirsting for the Lord. My third summer was marked by music. Because that was the summer that we held the Music boot camp. That was the summer that Mel, Jova, and I took turns handling the projector during times of worship. That was the summer that the worship team had a blast at the Matt Redman concert and we just bonded as a team. But more than that, the music that lingered was a music that played over friendship – friendship between sisters and newly made friends. I’ll treasure that summer because that summer, I met Kat and “re-met” Lisa. This Summer. I’ll keep this summer close in my heart because of many reasons. It’s the summer that I didn’t do anything yet still did a lot of things. Let me backtrack for a bit. At the start of the summer, I expected a lot of things. I expected to go to work, to be busy teaching, to pop in and out of the ministry at certain times but still be very busy with my work. But God had a different summer in mind. So I stayed in Elbi. And got involved in God’s work. Had my taste of being a full timer in the Lord. The summer was a swirl of CE’s, “fellowships”, OMG’s… oh yes, did I mention that this was the summer that I graduated? Haha. Almost forgot about that. But other things were of greater importance than my graduation. Like my brother’s attendance at the Youth Encounter. Like the bible studies Jaira and I had with Casey. Like the experience going to Church so Blessed in Manila. Like ice skating with the Yadao (and Igcasan) kids. And of course bonding with my batch mates. 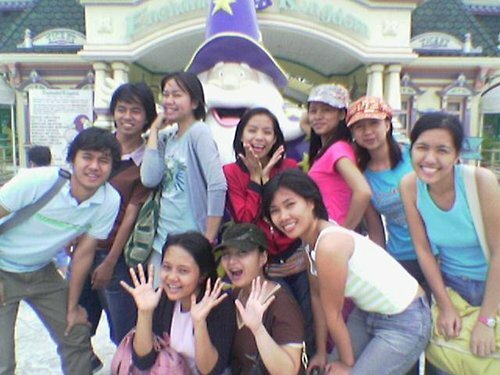 Enchanted Kingdom. I’ve only been to Enchanted Kingdomonce before. During that time, I went with my family, but the rides that we went on were limited. This time, I wanted to go on every ride because I didn’t want to leave EK with regrets hanging about me. And so my friends and I went on the bumper cars (Times 5? Or 6? Or was it 7?) We went on the Roller Skater, on Anchors Away, on the Swan Lake (haha), on the Jungle Log Jam (Twice? Thrice? Four times?) on the Rio Grande Rapids, on the Flying Fiesta, Up Up and Away, the Wheel of Fate, Bump and Splash… you name it. And of course we went on the Space Shuttle. That day was a blast. It was an adrenaline-filled day wherein we just let go of ourselves and just went on a full release mode. I don’t know about them, but personally, when I went on the rides (especially on the Anchors Away and the Flying Fiesta – and of course the Space Shuttle) I made a vow to myself that I would just let go of myself, to just free fall into that world where everything is going at top speed and you just have to ride with it. Into that world where you’re just free falling into – into God know’s what – but you know – you’re just free falling. Free Falling. That’s what I feel right now. I feel like I’m freefalling into the arms of a Mighty God. I don’t know exactly what the future will bring, but I just want to free fall into the arms of my Maker. Last Sunday we went swimming and Kuya Al taught us how to dive – and that’s what I feel like doing. I want to dive into His ocean of Love, into His ocean of infinite possibilities. And at the same time, I just want to be totally abandoned, as I was in the pool, with arms wide opened, floating, drifting in His love, with nothing but the waters surrounding me. Yes, this season is difficult. I have to dig a deeper grave each day. But as I dig those graves, it is then that I just let go of myself and freefall into my Father’s arms. And so the rain is just a mere drizzle outside my window. I’m still wearing pajamas. The mug of coffee that I’ve been craving for is still just that – a mug of coffee that I’m craving for. It’s almost time to end my melancholy moment but for all the things that happened this summer, let me just end with this. SDG. Soli Dei Gloria. All glory belongs to God.